2019. Matriculation qualified candidates are eligible to apply online for this HSSC Patwari Jobs. Online application link will be active on 21-03-2019 and last date to apply online is 23-04-2019. Official website to online form submission is www.hssc.gov.in. Candidates selection will be based on written exam only for this HSSC Patwari Jobs. 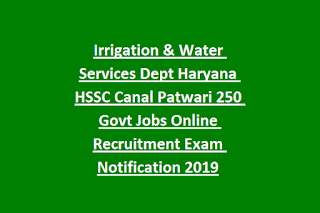 Category wise vacancies, age limits, salary and other details are updated below for this Haryana SSC Canal Patwari Jobs Recruitment 2019. There are total 892 Canal Patwari jobs in this Haryana Irrigation and Water Services Department. Age limits are 18-42 years for this Canal Patwari posts. Matriculation passed candidates are only eligible to apply online for this HSSC Recruitment 2019. Must have studied Hindi or Sanskrit subject up to 10th class level. Candidates will be selected on basis of Written Exam marks only. Written exam qualified candidates are called for Documents verification based on merit and category wise. Objective type written exam will be conducted for this Canal Patwari Jobs. Written Exam Syllabus covers the topics of General English, General Hindi, Haryana State Related General Knowledge, Current Affairs, Matriculation level mathematics (Reasoning/Arithmetic). 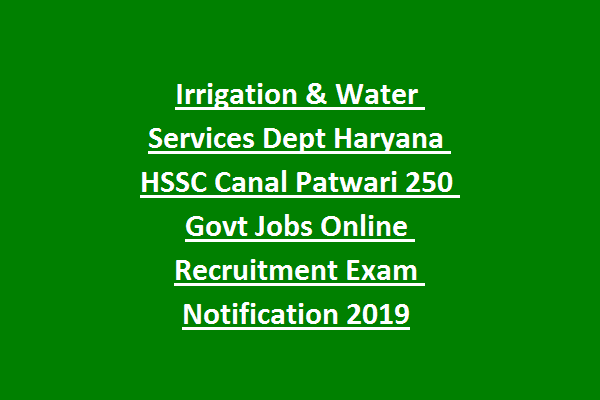 Apply online for this HSSC Canal Patwari Jobs recruitment 2019 notification. Online form link will be active from 21-03-2019 to 23-04-2019. Official website to online form submission is www.hssc.gov.in.